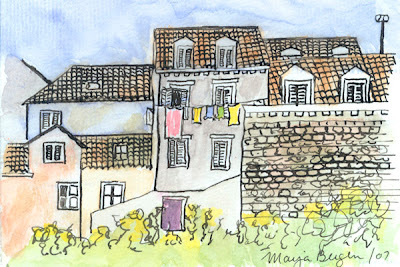 I’ve been puttering with pictures, drawing with India ink and then painting with watercolors. Making pictures to use as Christmas gifts is helping me look forward to Christmas. The picture above was made using a photograph my husband took in Dubrovnik earlier this year. But it’s time to leave play time behind for a while. Today I’m trying to focus on planning meals for the next few days (which I’ve done now – “yay! !”) and shopping for groceries. It has been such a long time since I’ve felt up to shopping. Our kitchen also needs a good tidying job. Then, tonight, perhaps I will have deserved to play my favorite game with my husband. We will play Ticket to Ride, a game involving a bit of luck and a lot of strategy. This morning I read something in my Bible that inspired me. Jesus – at a time when he was tired and hungry – said, “My food is to do the will of him who sent me and to finish his work.” (John 4:34) I think that’s the best kind of food for me as well and I will soon need to leave my child behind and continue doing what I believe God made me to do: helping Christians learn to understand and support those with mental health issues. That kind of “food” is healthy for me and makes me feel strong. I think that when Jesus said as he ministered to the woman at the well he was revived and no longer felt tired or hungry. I’m not too sure whether making pictures is food for my spirit. Not sure whether God made me to be an artist…though I did have a bit of fun. Drawing makes me feel like a child again and my childhood wasn’t a particularly happy one. It’s time to leave my child behind and be a grown-up again. I want to be strong. I want the healthy food – doing the will of God. Have a blessed weekend everyone. May you, too, find food to make you healthy and strong.